The Common Core Standards are intended to provide a consistent, universal, and clear understanding of what students are expected to learn across the United States. The authors say the standards are designed to be relevant to the real world and reflect the knowledge and skills our youth need to succeed in college and the world. The authors of the Common Core also say they strongly believe "that works of art should play a starring role in every child's education and in CCSS implementation." The arts will be officially adopted in the Common Core in the Spring of 2014. The Common Core State Standards (CCSS) believe that art must be carefully selected for the work to be effective and an engaging tool. They further state that the art must be of high quality, have an enduring interest and easily accessible. A recent draft of the new art standards shows a focus on art criticism. Below you will see examples that CCSS uses in their upcoming art standards. Two paintings (Above) students will look at are "Self Portrait" by French painter Gustave Courbet and "Self Portrait with Dark Coat" by Icelandic painter Louisa Matthiasdottir. Students will be asked to examine each painting closely and explain the genre of the paintings, draw parallels with biographies and auto-biographies, and determine which painting was painted first. Students will observe the clothing worn by the subjects in the paintings to help determine which was painted first. What color did each artist use? 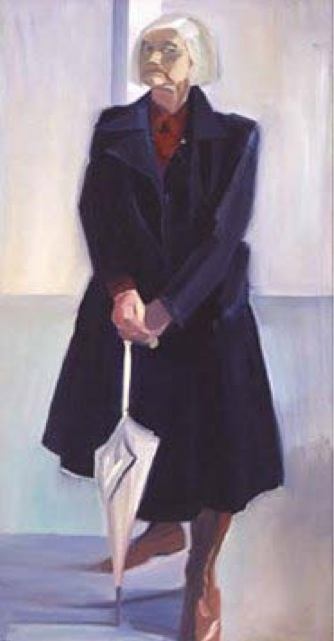 How did each artist position him or herself with respect to the viewer? To what extent did each artist choose to make his or her face a focus in the self portrait? How did the artist use their arms and hands as elements in their portraits? How did the artists use their clothes? What do you see in the environment around each subject? What does your survey of the elements in each work tell you about the kind of techniques painters use and the decision painters make about how to use those techniques? What do the painting titles suggest about the extent to which artist considered this work to be an accurate depiction of their state of mind? 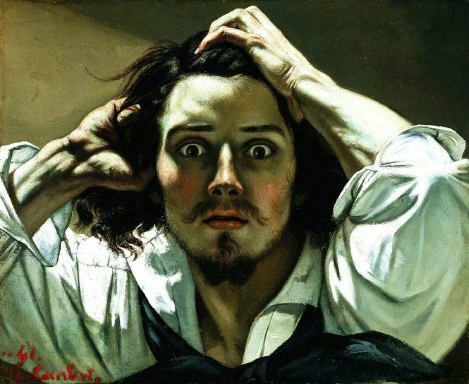 Are you convinced of Courbet’s desperation? The draft curriculum of this unit uses questions and writing as assessments. CCSS asks, "Do these self-portraits seem as different now as they did when you first saw them? Why or why not? Write a 1 - 2 page argumentative essay that draws on evidence from the works and what you have learned about the decisions artists make." There are no assessment examples shown in the draft plan for art production. Hopefully the authors will recognize that the visual arts stand on their own as a curriculum. There seems to be a heavy emphasis on integrated thematic instruction such as the lesson titled, "Reading the Art." Word choice and voice are some of the activities in the art criticism activities. Self-portraiture is created or examined when students are encountering memoirs. When studying history, works of art from a period of time or country may also be examined. Mathematics are integrated in ways such as using a pair of perpendicular number lines and axes to define a coordinate system. Students also represent real world mathematical problems by graphing. A major omission from the draft plan for the Common Core Arts is actual art production. It remains to be seen if this will appear in the final draft. The arts only seem to be included when supporting the language arts, mathematics, and history. Although the Common Core website states that 45 states and four territories have adopted the Common Core, several states have backtracked and have pulled out of CCSS. Almost every state now has an anti-Common Core website and many Americans are beginning to reject this federal government program. The Common Core assumes that all U.S. students will be on the same page and time across the entire country. It ignores the fact that students are individuals with individual strengths and learning styles. The program is also severely underfunded and is costing states millions to implement in spite of government grants. There is also a concern about the amount of personal information on each student that will be stored online. There are claims of data mining, cameras recording student expressions, electronic seats, and biometric wraps on students' wrists. Finally, the greatest criticism seems to be that the standards are less rigorous than existing state standards and will further expand the disparity in performance of American students with the rest of the world. Please post your opinion at the bottom of this page. The Arts and the Common Core Curriculum Mapping Project - [Archive] This is a collection of K-12 units that integrates art into ELA. Whether or not your state has adopted the Common Core, these units seem to be an excellent collection of integrated art. Guiding Principles for the Arts - [Archive] Seven Guiding Principles for the Arts are outlined in this document and should guide development of curriculum modules and accompanying materials. Art and the Common Core - [Archive] This is the presentation given at the EdWeek Webinar. It gives you a good idea what the final draft may look like. Common Core - [Archive] This is one of the primary websites of the Common Core. Common Core State Standards Initiative - This site is kind of a clearing house for states that implement the Common Core. STEAM Point: A Guide to Integrating Science, Technology, Engineering, the Arts, and Mathematics through the Common Core - A guide for teachers and administrators who are looking to leverage Science, Technology, Engineering, the Arts and Mathematics to close the achievement gap for all students and authentically teach practices embedded within the Common Core State Standards. The Common Core Guidebook: Informational Text Lessons, Guided Practice, Suggested Book Lists, and Reproducible Organizers, Grades 3-5 - This guide walks you through each informational text reading standard, aligns each standard to research-based strategies, and explicitly shows you how to introduce and model those strategies in your classroom. The Common Core Guidebook, Grades 6-8: Informational Text Lessons, Guided Practice, Suggested Book Lists, and Reproducible Organizers - Filled with practical techniques, anchor charts, reproducible graphic organizers, and suggested text lists, this indispensable guide helps teachers meet the demands of the Common Core informational text standards.